Yazid called for Nu'man bin Basheer, one of the companions of the Prophet of Allah (S), and ordered him to prepare the women-folk for the journey and to provide them with whatever they desired. He also told him to dispatch along with them a reliable and virtuous man from among the Syrians, as also some guards and servants. Then he bestowed them with clothes and gifts and provided them with provisions and food. Shaikh Mufeed says, that when Yazid desired to prepare them, he called for Imam Ali Zainul Abedeen (a.s.) in solitude and said,'May Allah curse the son of Marjanah! By Allah! If I had faced your father, I would have offered to him whatever he had desired from me, and I would have tried by all means to ward away death from him. But Allah had destined that to happen. You may write to me from Madinah and I shall give you whatever you desire'. Then he presented him and his family with clothes and dispatched Nu'man bin Basheer along with them as his envoy. He commanded him to move them at night and to remain behind them to guard, and when they camp, he along with his companions, should alight surrounding them and keep a watch upon them. Nu'man bin Basheer traveled alongside them and dealt with them leniently while arranging comfort for them as recommended by Yazid, until they reached Madinah. It is related from Yafe, that Hafiz Abu Alaa Hamadani says, that when the head of Imam Husayn (a.s.) was taken to Yazid, he dispatched it to Madinah. Then he called for a group from among the retainers of Bani Hashim, as also a group from among the retainers of Bani Sufyan, and dispatched them along with the survivors from the family of Imam Husayn (a.s.). He also prepared provisions for them and ordered to fulfill all their desires. Yazid said, Ã¢â‚¬Å“Rather you shall never be able to look at the face of your father, and as regards killing you, I have already abandoned the idea. While none, except yourself, shall accompany the womenfolk to Madinah, and as regards the belongings which were plundered from you, I shall give you more than that. He ordered these to be returned to them and also gave them two hundred Ashrafi from his own wealth. Imam Ali Zainul Abedeen (a.s.) took hold of the Ashrafi and distributed them among the destitute, then Yazid ordered that the Household (of the Prophet) be dispatched to Madinah. It is stated in Kamile Bahai, that Umm Kulthum (a.s.), the sister of Imam Husayn (a.s.), died in Damascus. Ibn Battutah, a contemporary of Fakhrul Mahaqqeqqeen the son of Allamah Hilli, in his travelogue entitled Tuhfatun Nazzar fi Gharaibul Amsar says, that on the western side of the city of Damascus, at a distance of one Farsakh,1 lies a place of pilgrimage dedicated to Umm Kulthum (a.s.), the daughter of Imam Ali bin Abi Talib (a.s.) through Sayyidah Fatemah (a.s.). Sayyid Ibn Tawoos says, that it is related regarding the head of Imam Husayn (a.s.) that it was taken back to Karbala and united with his blessed body. The belief of the Shi'ah evidences it and there are numerous other narrations supporting it, but we do not quote it due to brevity's sake. There is difference of opinion regarding the burial of the blessed head. Some say that Yazid dispatched the head to â€œAmr bin Sa'eed bin Aas, the governor of Madinah, who said,wish he had not sent it to me, then he ordered it to be buried at (the graveyard of) Baqi. While others say, that the head was kept in the treasury of Yazid until Mansoor bin Jamhoor conquered Damascus. He found the head in a red basket with traces of dye still visible upon it. He then buried it in â€œBaab al Faradees' in Damascus. While still others say, that Sulayman bin Abdul Malik found the head in the treasury of Yazid, he wrapped it in five shrouds of brocade, then he recited the Prayers upon it, along with his companions, and buried it. But that which is renowned among the Imamiyah Scholars, is that it was buried along with it's blessed body by Imam Ali Zainul Abedeen (a.s.), or also that it was buried in the grave of the Commander of the faithful Imam Ali (a.s.) as is found in numerous reports. Ibn Shahr Ashob says, that Sayyid Murtaza in one of his treatises says, that the head of Imam Husayn (a.s.) was returned to Karbala from Syria and was united with the body. While Shaikh Al-Tusi quotes the Ziyarat al Arbaeen from here. It is quoted in the history of Habibus Siyar, that Yazid handed over all the heads to Imam Ali Zainul Abedeen (a.s.) and he (a.s.) united them along with their bodies (at Karbala) on the twentieth day of the month of Safar and then left for Madinah. And it is said that this report is accurate regarding the burial of the head. Sibt Ibn Jawzee in his Tazkirah says, that five narrations have been related regarding the place of the burial of the head: (1) In Karbala, (2) In Madinah, close to the grave of his mother (a.s.), (3) In Damascus, (4) In the Mosque of Riqqah (in Syria), and (5) In Cairo. But the renowned one among them is that it was taken back to Madinah along with a group of noblemen, and from there it was taken to Karbala and buried along with the body there. Then wherever and in whatever state is his head and body buried, it dwells in the hearts and conscience of men and occupies a place of residence in the essence and memory of all. It is related in Malhoof, that the narrator says, that when the household of Imam Husayn (a.s.) left Syria and reached Iraq, they told their guide, Take us through Karbala. Then when they reached the place of martyrdom, they saw that Jabir bin Abdullah Ansari (a.s.), along with a group of Bani Hashim and the family of Prophet (S), had come to visit the grave of Imam Husayn (a.s.). They met one another with grief and wailing while beating their faces. Then a heart-rending mourning ceremony commenced and the women from the adjoining towns too joined them and they all mourned there for a few days. Shaikh Ibn Nima too quotes something similar in his book of Martyrdom. O' Basheer! May Allah have mercy upon your father, he was a poet. Then can you recite elegies too? I mounted my horse and galloped, until I reached Madinah. When I reached the Mosque of the Prophet (S), I started weeping and called out,O people of Yasrib! There is no place for you to abide here, Husayn has been killed for which my tears flow, his body lies in Karbala smeared in dust and blood, while his head was being paraded upon the lance from place to place. Then I retorted, This is Ali bin Husayn (a.s.), who has reached your outskirts and the place of your city of Madinah, along with his aunts and sisters. He has sent me so that I may announce his place of descen,. hearing this all the veiled women of Madinah ran out lamenting. While I ever never witnessed such weeping ever before nor do I know anything more bitter than this upon the Muslims. I heard a girl weeping upon Husayn while saying,You have brought the news of the martyrdom of my master and aggrieved me and made me unwell, while this news has distressed my heart, then O my eyes! Shed abundant tears of sorrow constantly, upon the one upon whose grief the heavens of the Almighty have fallen down, his martyrdom has punctured nobility, Religion and ardor, then lament upon the son of the Prophet of Allah (S) and Ali (a.s.), although his grave be far far away. Then the girl turned towards me and said, O messenger of death! You have renewed our grief for Abu Abdullah, and you have abraded our internal wound that had not yet healed. May your Lord have mercy upon you, who are you?I replied, I am Basheer bin Jazlam and my master Imam Ali bin Husayn (a.s.) has sent me, while he himself, along with the family of Abu Abdullah al Husayn (a.s.), has camped at such and such place. Then the people left me and ran towards the place. Then I mounted my horse and returned until I saw that the people had occupied all the roads and streets. I dismounted from my horse and started stamping the necks of people until I reached the tent. Imam Ali bin Husayn (a.s.) was therein and he came outside wiping his tears with a handkerchief. A servant followed him carrying a chair and placed it down and Imam (a.s.) sat upon it. His tears were constantly flowing while the voices of lamenting of men increased and women too started wailing. Then people started condoling him from all around while a severe uproar arose upon that place. All praise be to the Lord of the worlds. The Master of the day of Qiyamah. The Creator of all creation. By the Lord Whose comprehension is far away and Who is so near so as to hear the secrets (of his slaves). I extol Him upon the grave event and the disasters of age, and upon the severity of griefs and bitter taste of tragedies, and the great sorrow and grand griefs, heart-rending and afflicting hardships. O people! Verily Allah, the worthy of praise, tried us by means of great sorrows while a deep fissure manifested in Islam. Abu Abdullah al Husayn (a.s.) and his family were martyred, while his women and children were driven in captivity. His head was paraded in the cities upon the lance, while this disaster is incomparable. O people! Which of your men would delight after his death, and which of your hearts would not scorch for him? Which of your eyes would spare it of tears, and which of you would restrain yourself from beating your faces? Seven elevated heavens wept upon his martyrdom, while the rivers along with their waves, the heavens along with their pillars, the earth along with her outskirts, and the trees along with their branches, the fishes of the oceans and their depths, the Angels in proximity (to Allah), as also all the dwellers of the heavens lent their voices in lamenting upon him. O people! What hearts are there that would not rip upon his martyrdom? And what consciences are there that would not scorch upon it? And what ears are there that would not turn deaf when they witness this fissure manifested in Islam? O people! We were driven forth and paraded from far and near the cities as if we were the children of Turkish or Kabuli descent, without having committed a crime or performed evil deeds, nor are we one of those who have created the fissure in Islam. Never did we even hear such thing from our ancient forefathers, this is nothing but new. By Allah! If the Prophet (S), instead of making recommendations for us, had entrusted them to fight us, they would not have done to us any more harm than what they already have done. The narrator says, that hearing this Sawhan bin Sah bin Sawhan, who had turned paralytic, stood up facing him and asked pardon, for his legs were paralyzed (and thus he could not assist him). Imam (a.s.) accepted his plea and displayed his pleasure towards him and thanked him, while asking Allah's mercy to be bestowed upon his father. Jazari and Ibn Sabbagh Maliki say, that Yazid dispatched a trustworthy man from among the Syrians, along with Ahlul Bayt (a.s.) and enjoined him regarding them. Some horsemen also accompanied him until they reached Madinah. This man has certainly favored us, then should we not compensate him? He returned all of it back saying,If I had done this for the world, it would have been sufficient for me. But by Allah! My intention was none except the pleasure of Allah and the Prophet of Allah (S). I do not desire having any other father-in-law after the Prophet of Allah (S). She did not enter the shade of her house for one year after his martyrdom and became ill and died of anger. It is said that she remained at the head of Imam (a.s.)'s grave for one year and then returned back to Madinah and succumbed to grief. While the elegies recited by her are extensive, but we conclude here for the sake of brevity. O grandfather! I announce to you the news of the death of my brother Husayn. Saying this her tears started flowing continuously and she could not hold back her lamenting and weeping. And each time her sight fell upon Imam Ali bin Husayn (a.s.), her grief would become afresh and her heartache would increase. There is no other Deity except Allah in all certainty, there is no other Deity except Allah in devotion and humility, there is no other Deity except Allah in faith and truth. Then he lifted up his head from prostration, while his beard and face was soaked with the tears of his eyes. Seeing this I said, O my master! Your sorrow has not diminished and your lamenting has not ceased? Woe be to you! Yaqoob (a.s.) was a Prophet and had twelve sons. One of his sons (Prophet Yusuf) was concealed from his eyes by Allah, and the hair of his head turned grey due to extreme sorrow, and his back bent due to this anxiety, while the sight of his eyes faded due to excessive weeping, and all this although his son was alive in this world. While I have witnessed my father, brother and eighteen members from among my family fallen upon the ground and martyred, then how could my sorrow diminish and tears cease? There is no problem. Prophet Moosa (a.s.) tore off his collar upon the death of his brother (Prophet) Haroon (a.s.). A father may not tear off his collar upon the loss of his son, nor a husband upon that of his wife, but a wife can tear off her collar upon the loss of her husband. 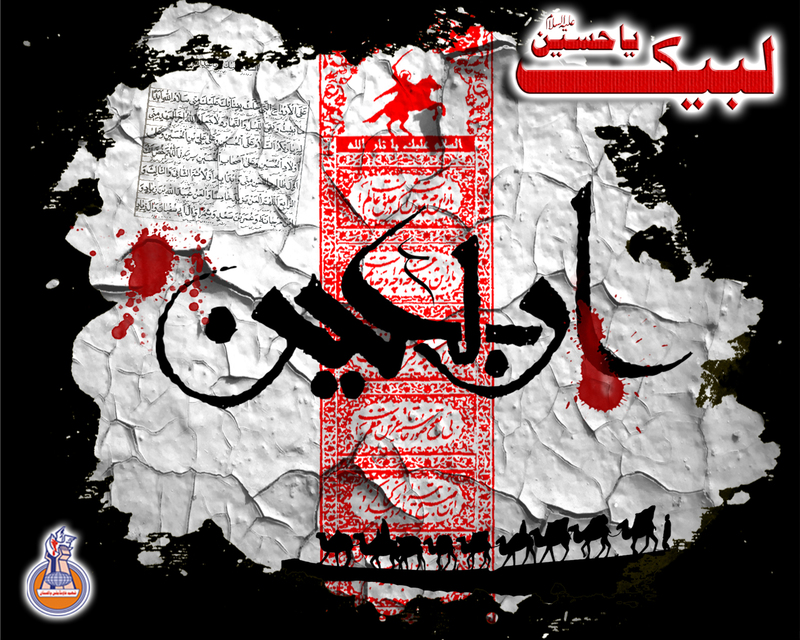 Then he continued, The family of Fatemah (a.s.) tore off their collars upon Husayn (a.s.) and beat their faces. And he was worthy enough that the collars should have certainly been torn and faces beaten upon his loss. He (Imam Zainul Abedeen) wept upon Imam Husayn (a.s.) every day and night for one year, and this lamenting continued for three years after the day of his martyrdom. Barqi relates, that when Imam Husayn (a.s.) was martyred, the women of Bani Hashim wore black and the mourning dress and did not complain against heat or cold, while Imam Ali bin Husayn (a.s.) arranged for their mourning meals. The Trustworthy Authority of Islam Shaikh Kulaini (May Allah cool his resting place) relates from Imam Ja'far as Sadiq (a.s.), that when Imam Husayn (a.s.) was martyred, one of his wives arranged for a mourning assembly. She wept, as also the ladies and her maids, until their tears dried up, but they saw that one of her maids was still weeping. She called for her and asked,What have you done that your tears still flow (while ours have dried up due to constant weeping)? She replied, When I became weary, I consumed Saweeq. It is said that then she ordered food and Saweeq to be prepared; she ate and drank it and gave it to others and said.We shall derive benefit through its medium for the mourning upon Imam Husayn (a.s.). It is said, that a bowl of food was presented to this woman so that she could benefit from it while mourning Imam Husayn (a.s.). When she saw it, she said, .What is it? They replied, Such and such has sent it for you so that it may be beneficial for weeping upon Husayn. She replied,We do not have any wedding ceremony here, then what do we have to do with it? Then she told the women who had accompanied her in mourning to leave. They went out and as soon as they stepped out of the house, they vanished, and as if they started flying in between the heavens and earth, while their tracks were never visible. Imam Ja'far as Sadiq (a.s.) says, that none of the women of Hashimite descent applied collyrium or dyed their hair, nor did smoke ever come up from their houses (they did not cook) for five years, until Ubaydullah bin Ziyad was killed. It is related in the Tareekh of Zahabi, that in the year 352 A.H. on the tenth of Muharram, Mu'iz ad Dawla commanded the people of Baghdad to mourn Imam Husayn (a.s.). He ordered the markets to be shut and symbols of mourning to be displayed upon them. Cooking was barred and the Shia women came out lamenting and beating their faces, while this continued for some years. It is related in Tareekh of Ibnul Wardi, that in the year 352 A.H. Mufid Dawla ordered people (of Baghdad) to lament upon Imam Husayn (a.s.) and beat their breasts, while the women should dishevel their hair and mourn. The Sunnites could not prevent it, for the sovereign was along with the Shi'ah. It is related in Al Khutat wal Asar of Maqrizi, that Ibn Zulaq quotes in the book Seerat al MuÃƒâ€ Ã¢â‚¬â„¢iz le dinillah, that on the tenth of Muharram of 363 A.H. a group from among the Shiah, accompanied by their adherents and the cavalry of Mugharebah and their men, return back in the procession of mourning upon Imam Husayn (a.s.) from the Mausoleums of Sayyidah Umm Kulthum (a.s.) and Sayyidah Nafeesah (a.s.). It is quoted in some books, that in the year 423 A.H. mourning upon Imam Husayn (a.s.) took place in Baghdad. Abu Rayhan (al Biruni) in his Asarul Baqiyah states, that the tenth of Muharram was considered sacred near the Arabs until Imam Husayn (a.s.) was martyred on that day. Then they treated him and his companions in a manner in which no other nation treated the worst of their people as regards to hunger and thirst, the sword, burning (the tents), raising the heads upon the lances, and galloping the horses upon their bodies. Then they (Shiah) considered that day to be inauspicious, but the Bani Umayyah celebrated on that day and adorned new dresses and organized feasts and celebrations, they prepared sweets and distributed scents. And until the kingdom of Bani Umayyah prevailed, this custom remained. And even after the sunset of their kingdom, this customs prevails among some. While the Shi'ah, in grief upon the martyrdom of Imam Husayn (a.s.), recite elegies and lament. And this custom prevails in the â€œCity of Peace" Baghdad, as also the other cities. And on that day they go for the pilgrimage to his felicitous grave at Karbala.